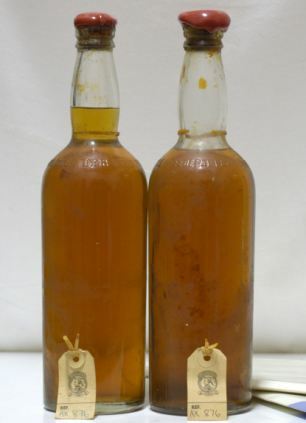 Two rare bottles of whisky salvaged from a shipwreck which inspired a book and film are to be auctioned. The collector's items were part of the cargo on the 8,000-ton cargo ship the SS Politician which sank off the shores of Eriskay in the Outer Hebrides in 1941 and inspired the book and film Whisky Galore. The bottles, which have documents of authentication, are to be sold as a pair by Britain's biggest internet-only auction site Scotch Whisky Auctions, based in Glasgow, with bidding opening on Saturday and closing on May 5. >A great deal of interest is expected due to the unusual and legendary story behind where they came from. Scotch Whisky Auctions director Bill Mackintosh said: 'Everybody loves the idea of the wily islanders diving to the bottom of the wreck and coming back up with bottles of whisky which they would then hide from the customs. The eight bottles surfaced in 1987 when local man Donald MacPhee from South Uist in the Outer Hebrides explored the wreck and found his liquid treasure. He sold them at auction with Christie's and got £4,000 for his loot. Two of those bottles were bought by a man in Fraserburgh in Aberdeenshire. He has recently died and his widow decided to sell them along with the neck tags from Christie's and letters of authentication.